It’s hard to make a difference for ourselves, our families, our customers and society in general if we are out of business. If we build something, we want it to be great (meet our goals) and we want it to last. This eBook asks some tough questions and delivers proven insight to help you do just that, create a sustainable business. 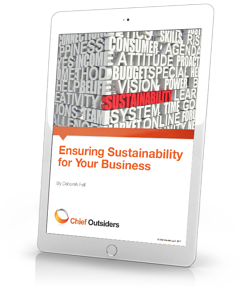 Download this eBook to find out how you can make a difference now to increase the longevity of your enterprise. If you have more questions or want additional information, contact Deborah Fell directly at dsfell@chiefoutsiders.com or 240.494.6404.